Looks like a little slice of heaven, right? Don’t be fooled: this recipe is sinfully delicious, loaded with sugar, butter, eggs, and cream. Your waistline may not thank you, but your taste buds sure will! 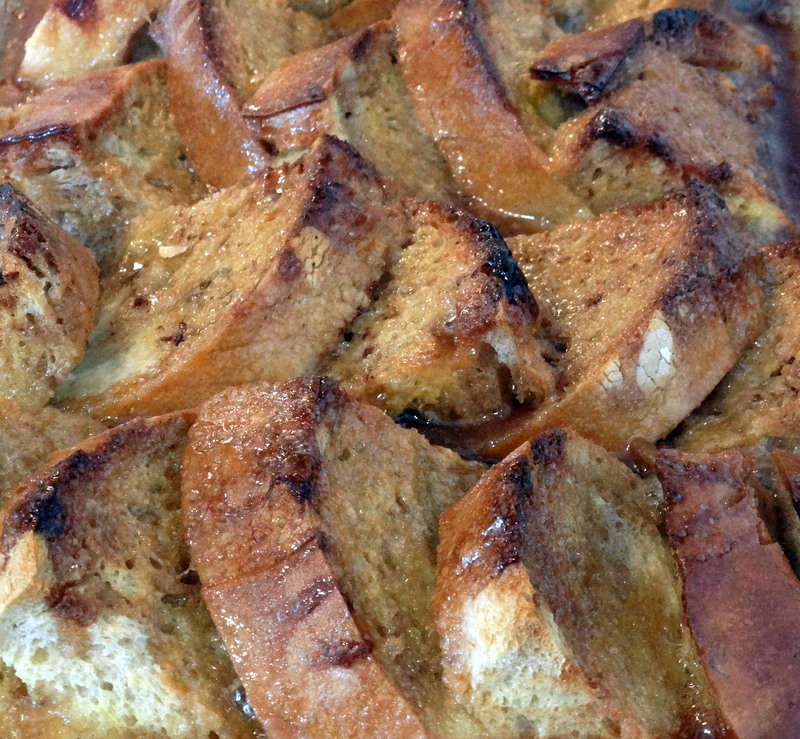 I’ve been making this version of French toast for years whenever we have house guests. Not only does it taste amazing, but it’s fairly easy to prepare and can be whipped up a day or two ahead of time. 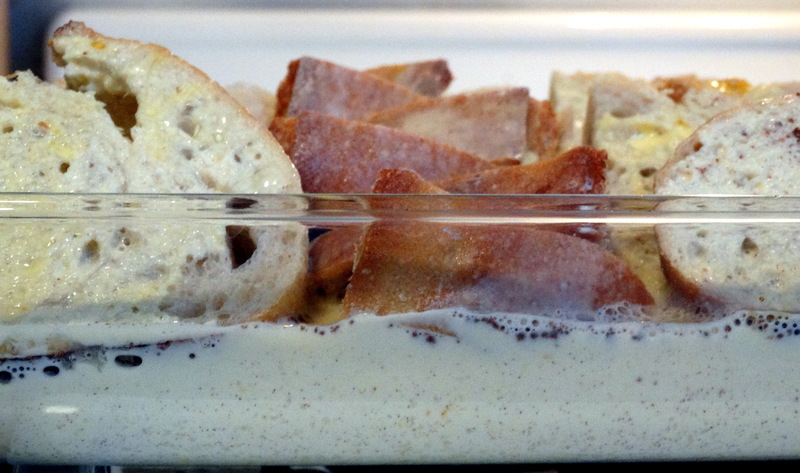 The sugary top gets nice and crunchy, while the bottom turns to decadent custard. Yum! 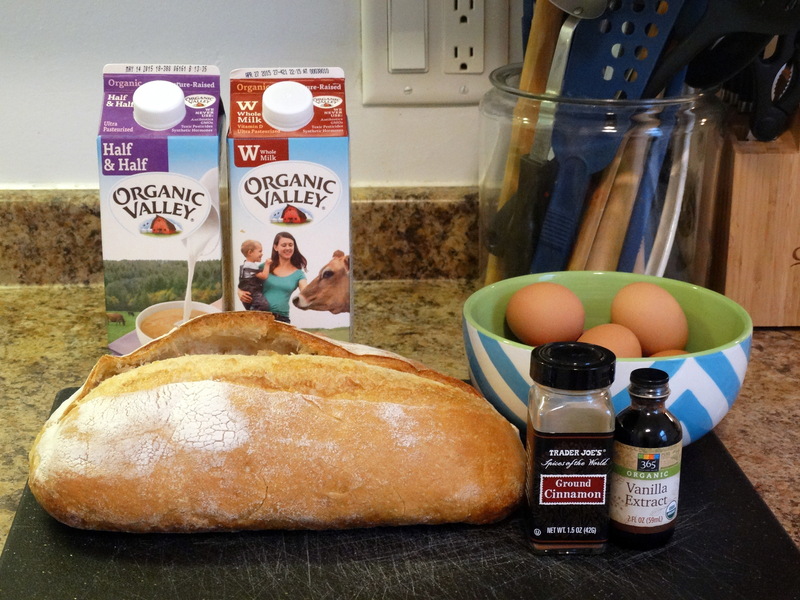 The night before you are planning to wow your taste buds, gather the following ingredients: one loaf of rustic Italian bread, 8 eggs, 2 cups whole milk, 1-1/2 cups half-and-half cream, 2 teaspoons vanilla extract, and 1/4 teaspoon ground cinnamon. 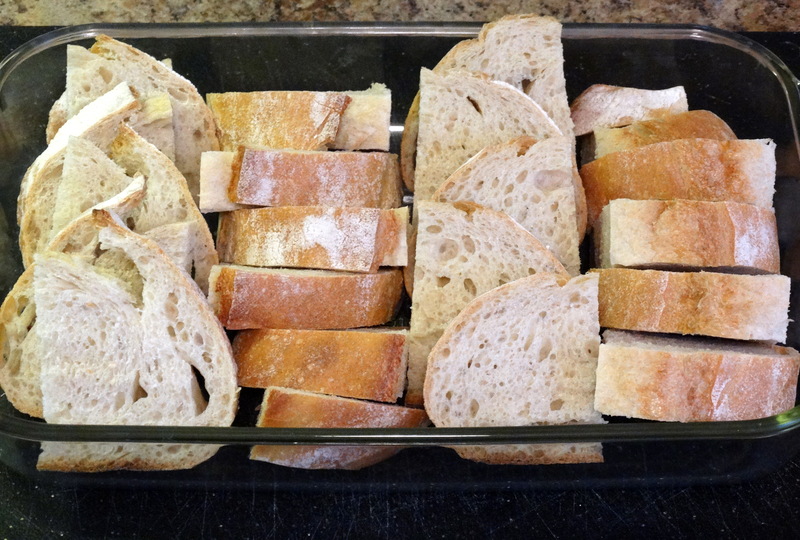 Slice your loaf of bread into 3/4″-1″ slices and arrange them into a 9″ x 13″ baking dish. The loaf that I used was pretty wide, so I cut it in half lengthwise first. Combine 8 eggs, 2 cups whole milk, 1-1/2 cups half-and-half cream, 2 teaspoon vanilla extract, and 1/4 teaspoon ground cinnamon in a large bowl and whisk until well combined. 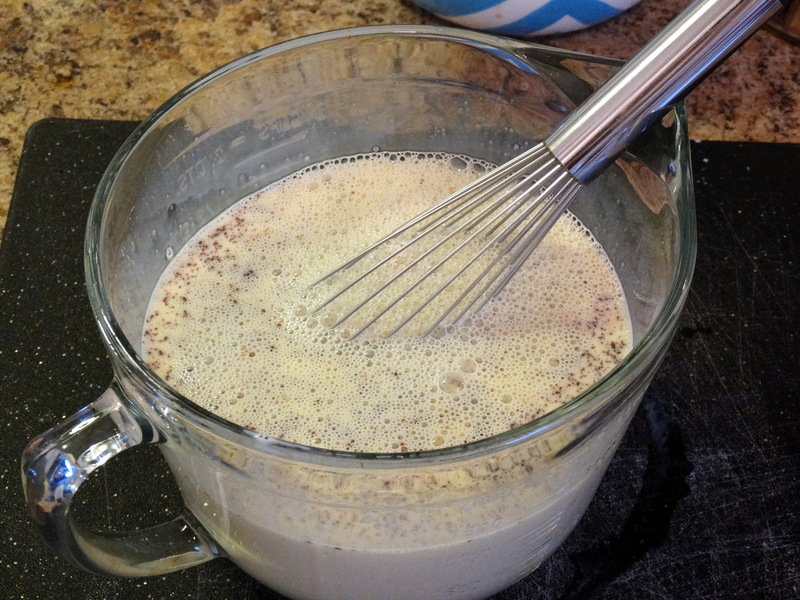 If you have a batter bowl, I recommend using it to make pouring the egg mixture over the bread easier. Pour all of the mixture evenly over the bread. Cover it with plastic wrap and put it in the refrigerator overnight. 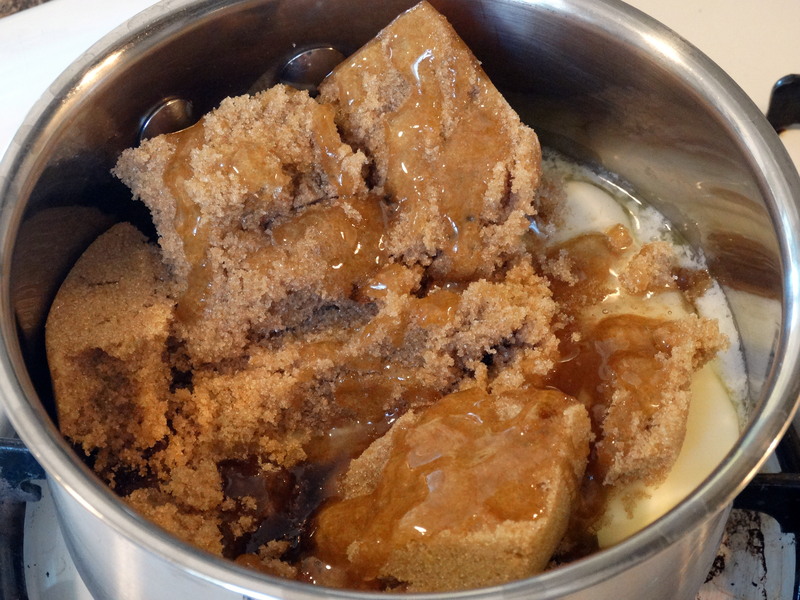 In the morning, get out a small sauce pan and a few more ingredients: 3/4 cup butter, 1-1/3 cups packed light brown sugar, and 3 tablespoons of light corn syrup. (I warned you that this wasn’t healthy!) Preheat the oven to 350 degrees. 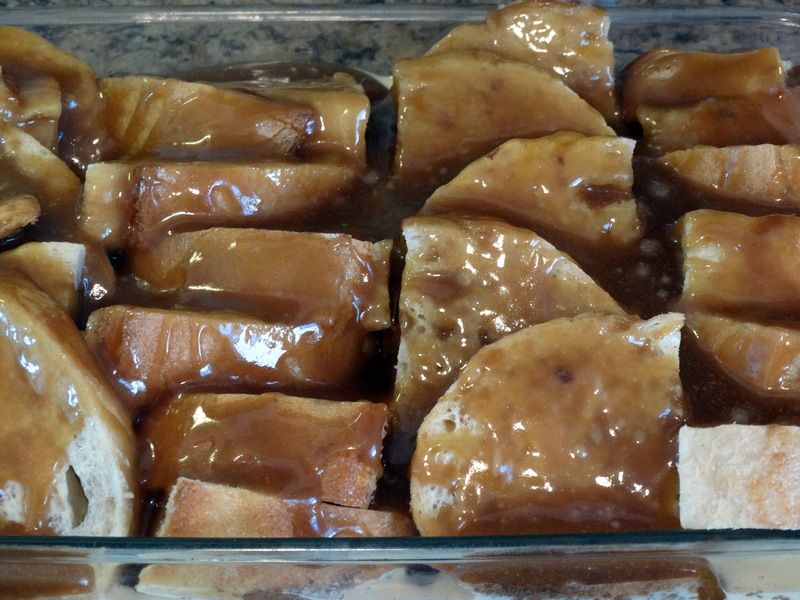 Put the butter, sugar, and corn syrup in the sauce pan and apply low-medium heat. Stir often until everything is well combined and bubbling gently. 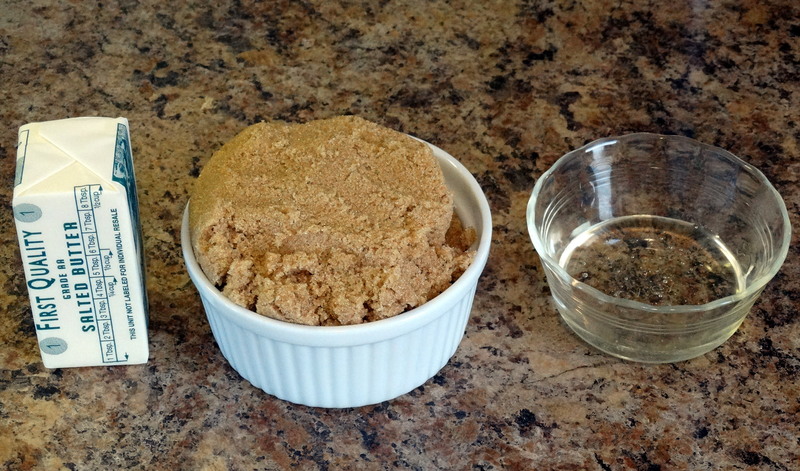 Remove the bread mixture from the refrigerator. Slowly pour or spoon the sugar mixture over the bread, completely covering the top. Bake for 60 minutes. Remove from the oven and let cool for at least five minutes before serving. 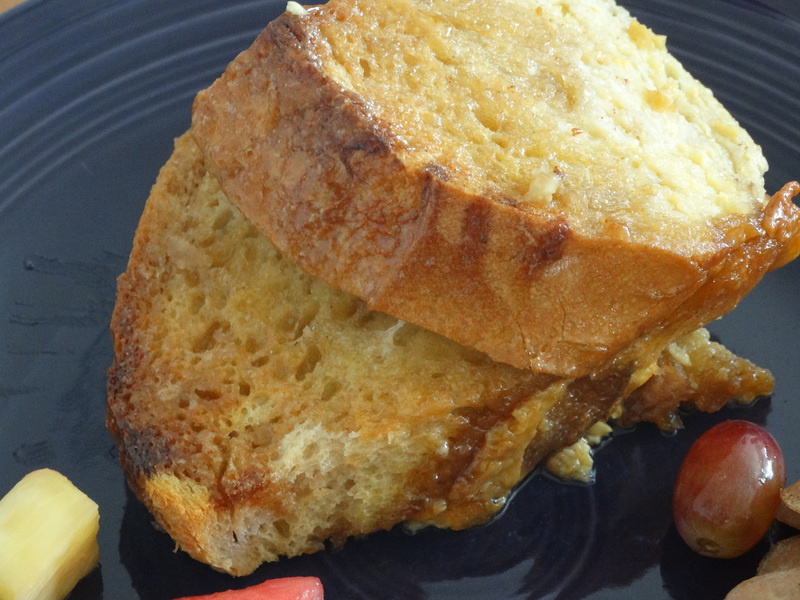 Might I suggest serving your Dreamy Baked French Toast with some bacon or sausage? And perhaps a little fresh fruit to help offset all of the butter and sugar? Lol. Enjoy! 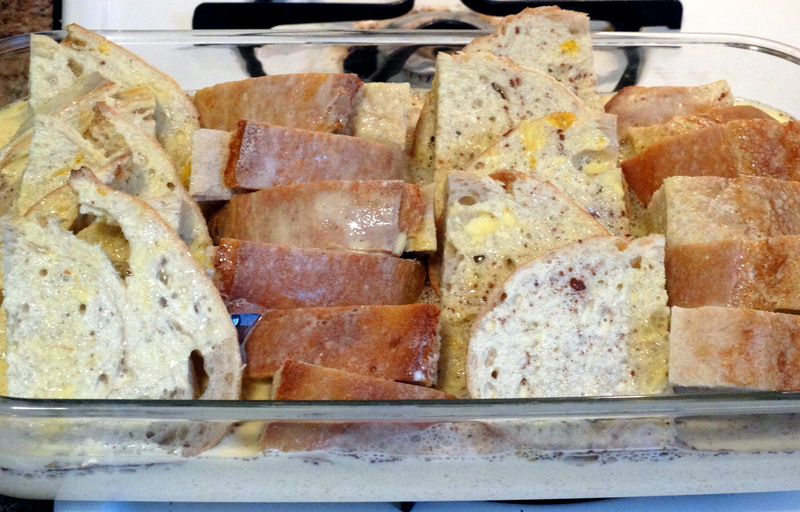 1) Slice your loaf of bread into 3/4″-1″ slices and arrange them into a 9″ x 13″ baking dish. Combine 8 eggs, 2 cups whole milk, 1-1/2 cups half-and-half cream, 2 teaspoon vanilla extract, and 1/4 teaspoon ground cinnamon in a large bowl and whisk until well combined. 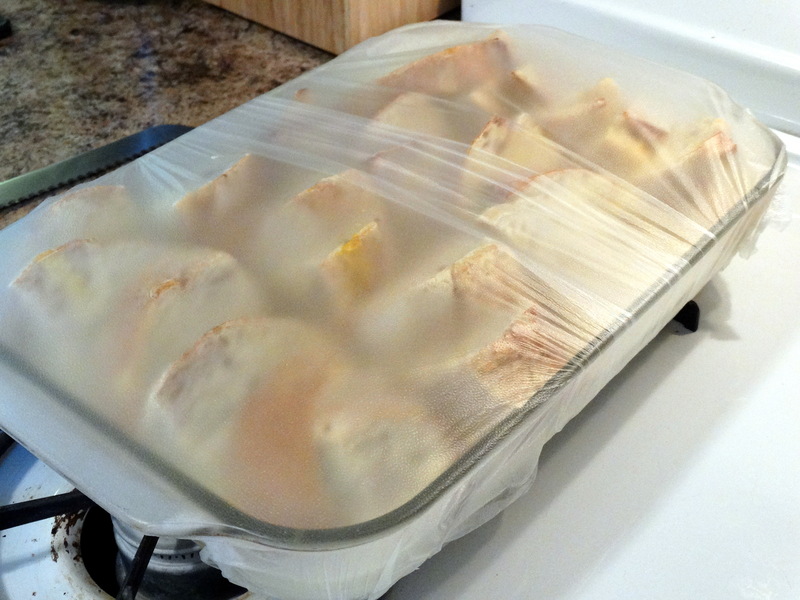 Pour all of the mixture evenly over the bread, cover it with plastic wrap, and refrigerate overnight. 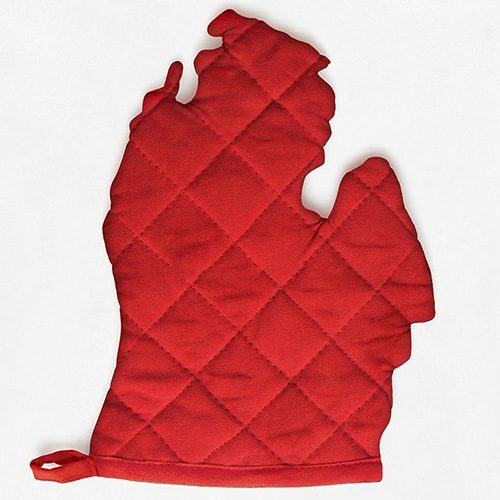 2) Preheat the oven to 350 degrees. 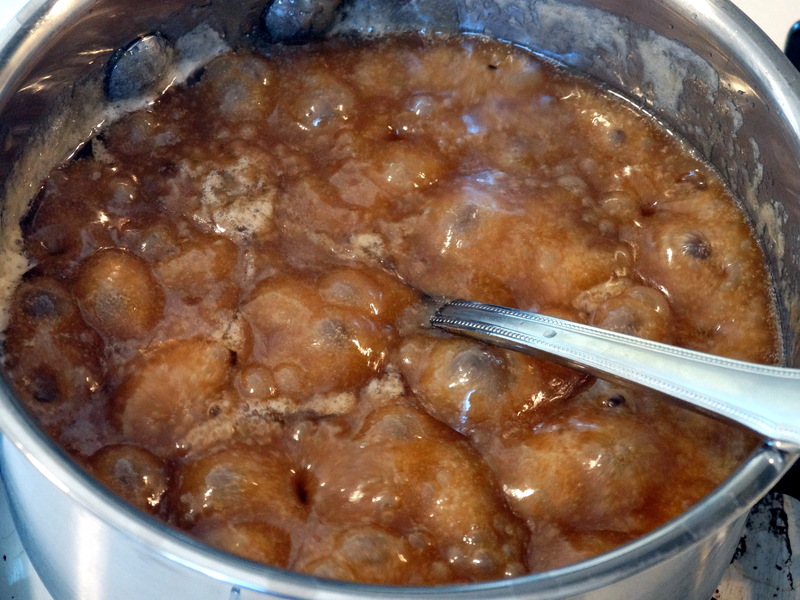 In a small sauce pan, add 3/4 cup butter, 1-1/3 cups packed light brown sugar, and 3 tablespoons of light corn syrup. Cook over low-medium heat, stirring frequently until well combined and bubbling gently. 3) Remove the bread from the refrigerator. 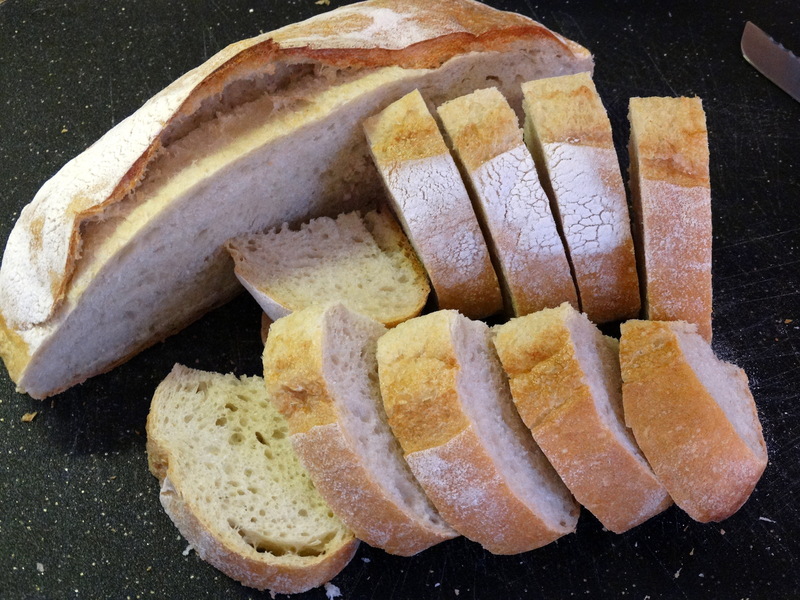 Slowly pour or spoon the sugar mixture over the bread, completely covering the top. Bake for 60 minutes. Remove from the oven and let cool for at least five minutes before serving.